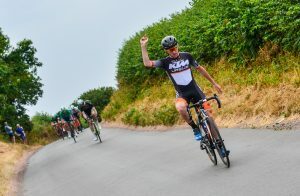 Callum Ferguson (Team KTM) powered up the finishing climb before riding clear for victory in round 10 of the South Staffordshire and Shropshire Road Race League. On his first appearance at this year’s road race league Ferguson, from Bromsgrove, used his power to ride clear at the top of the second ascent up Bromley Bank, near Bridgnorth after 34 miles of racing. With the top two overall riders Kirk Vickers and Matthew Garthwaite both sitting out the latest round it was a weakened scratch handicapped group. After catching the first couple of groups ahead of them on the road the impetus from the bunch went with groups still ahead of them. Ferguson looked to close the gap individually and then was joined by Jack Stanton-Warren (Wheelbase Castelli MGD). However, the pace rose from the peloton and the escapees were caught and the race came together before the final ascent up Bromley Bank. With the race strung out up the climb Ferguson waited until over the top of the climb to power clear to victory. “I knew that at that time of the race people would be tired and that it would stretch out over the top,” said Ferguson. Ferguson took the victory by a couple of bike lengths while Jamie Crump (Successcycling.co.uk) led the charge for second. Last year’s overall series winner Ben Joughin (Pro Vision RT) took advantage of the absence of Vickers and Garthwaite to take third on the night and move up to second overall. Jamieson Blain (Halesowen A & CC) kept his hopes of clinching the junior overall series victory alive by taking fourth reducing the gap on junior series leader George Mills-Keeling (Pro Vision RT) who finished seventh. Matthew Morris (Wolverhampton Whls) was fastest veteran in 10th although Phillip Glaze (Stourbridge CC) holds a commanding lead in that category in the overall series. With two rounds remaining the series returns to Enville next week when Vickers could seal the overall series victory.